Oman Air, the sultanate’s national carrier, has chosen Air France Industries KLM Engineering and Maintenance (AFI KLM E&M) to provide flight hour support for the CFM56-7 power plants that equip the airline’s Boeing 737NG aircraft. The long-term contract was formally signed in Amstelveen, The Netherlands, by Oman Air chief executive Paul Gregorowitsch and Ton Dortmans, the executive VP at KLM Engineering and Maintenance, in the presence of Mohammed bin Harub bin Abdullah Al Said, Oman’s ambassador to the Netherlands, and KLM president and chief executive Dr Ing Pieter Elbers. AFI KLM E&M is a major multi-product maintenance, repair and overhaul (MRO) provider. On the deal, Gregorowitsch said AFI KLM E&M has a well-deserved, outstanding reputation for maintaining CF M56-7 power plants and we are pleased to be signing this new contract with the company. “Oman Air’s over-riding priorities are the safety of its passengers and crew, the reliability of its aircraft and an excellent on-time performance. Air France KLM’s expertise and professionalism will help us maintain our unblemished record in each of these vital areas,” he noted. Franck Terner, executive VP, Air France-KLM, said the MRO has been working regularly with Oman Air for several years. “I am very pleased that the airline has now shown us this mark of trust by opting for our engine know-how,” he added. 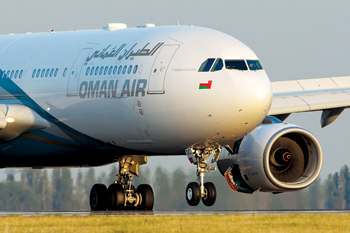 The new partnership has been sealed even as Oman Air continues its ambitious programme of fleet and network expansion. This will see the national carrier of Oman increase its fleet size from 30 aircraft at the start of the programme to 70 aircraft by 2020.